Article by Laura Brockett, edited by Dave DeGrottola and John Scarinza. All photos by John Scarinza. 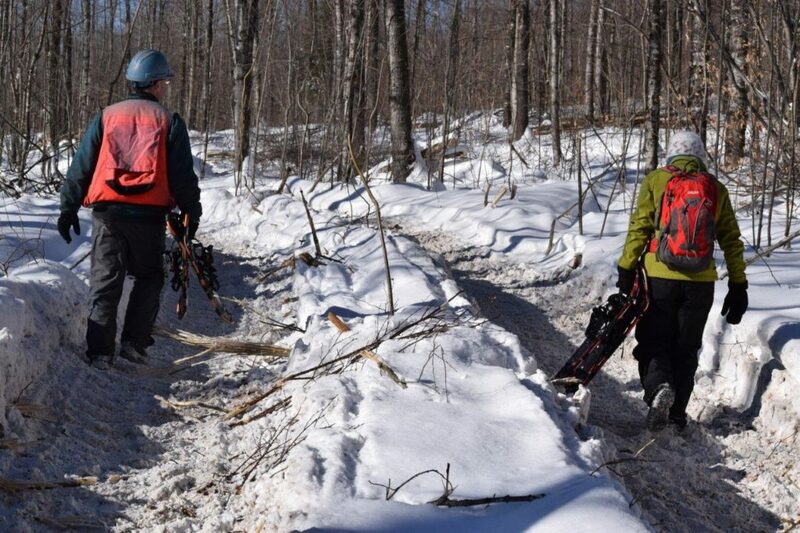 In early January 2018, John Scarinza and Laura Brockett met with forester, David DeGruttola, at the timber sale known as “FIRST SALE” on the Randolph Community Forest. David works for LandVest which is the company that manages our Town Forest. Currently, there are three harvest areas that are slated to be harvested during the winters of 2018 and 2019. They are called the FARRAR SALE, FIRST SALE and 2B or not 2B. The “FIRST SALE” is located on the left; just after Jefferson/Randolph town line as you enter the Town Forest from Ingerson Road in Jefferson, NH. 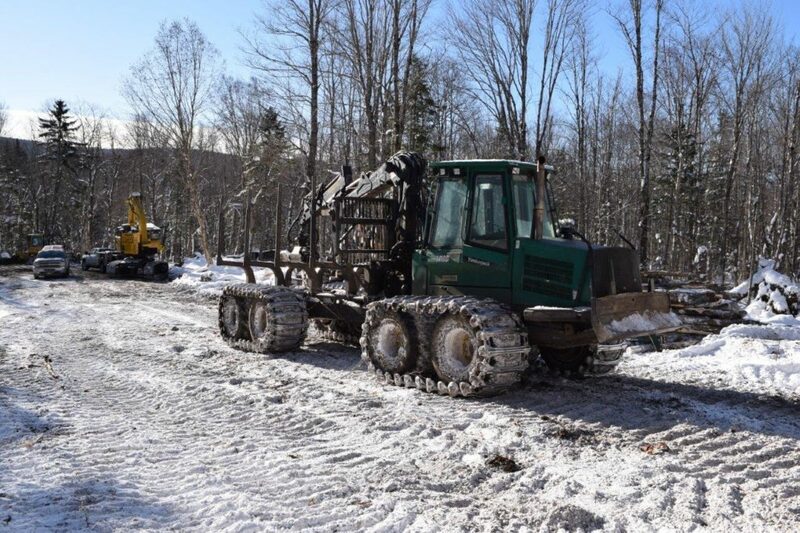 The harvest area is just less than 500 acres in size comprised of mostly yellow birch and sugar maple. Other species include aspen, beech, white birch, red maple, and white ash. The area is being harvested to reduce stocking and reallocate growth to trees that will continue to appreciate in volume and value. David and LandVest Staff Forester Patrick Smerczynski, mark each tree to be harvested with blue paint. In addition, timber sale harvest boundaries, stream/wetland buffers, and stream crossings are marked and identified prior to the start of the timber harvest. 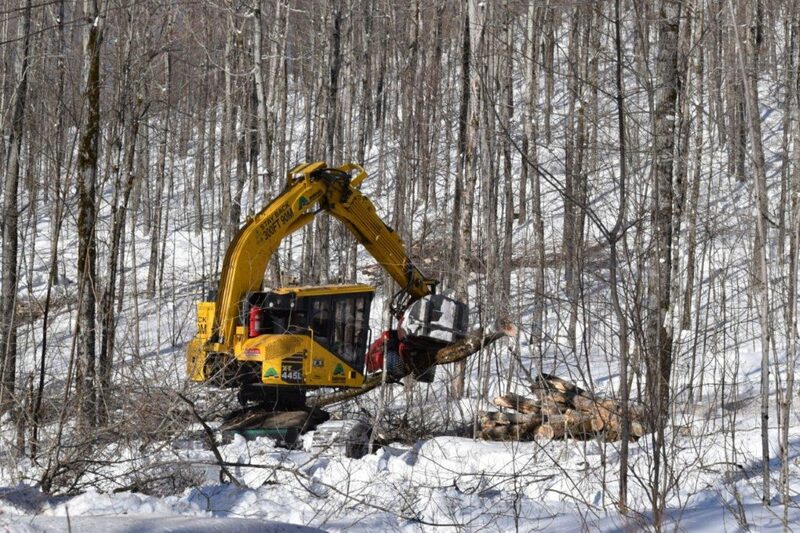 A two- person logging crew running a Cut to Length system operates the harvest area. A Cut to Length harvesting system consists of two pieces of equipment, a Processor and a Forwarder. 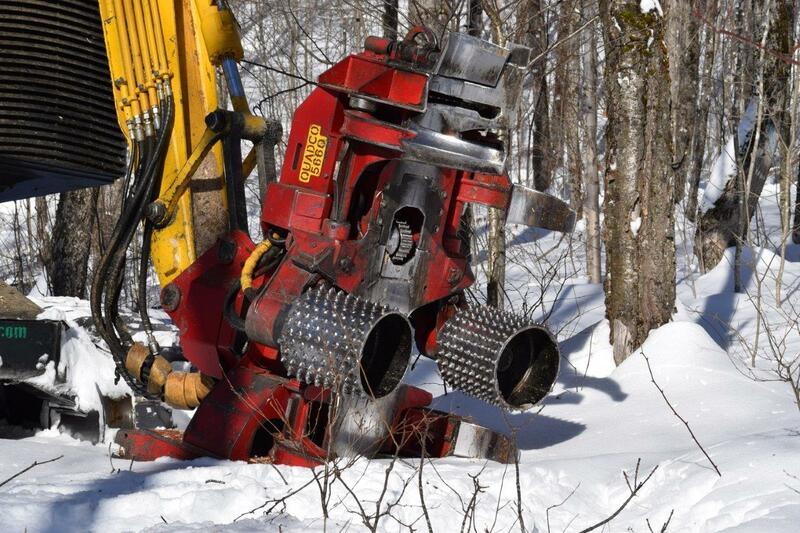 The Processor harvests the tree and processes it into the various forest products in the woods. The Forwarder follows behind picking up piles of wood. There are no chainsaws or skidders to be seen. Both men work in equipment that allow them to safely and efficiently harvest up to 300-400 trees per day. The Processor is similar to an excavator with a cut to length processing head instead of a digging bucket. The Processor cuts and holds the tree. The tree is then turned 90 degrees and cut into the various forest products. The processor operator evaluates the tree for potential products prior to the tree being harvested. Once the tree is cut and turned the final products are determined as the tree is measured for length and diameter for pulpwood, sawlogs and pallet. The tops and small side branches are then laid down in the skid trail the equipment will travel over. Leaving coarse woody debris helps prevent sediment movement on skid trails and keeps some nutrients and carbon on site. The Forwarder picks up the piles left from the Processor and carries them back to the yard. On the yard the harvest timber is sorted into the appropriate pile based on product. The pulpwood will travel to the Carrier plant in Shelburne, NH to be turned into paper chips for the Catalyst mill in Rumford, ME. The pallet logs will go to the Isaacsons mill in Livermore, ME. 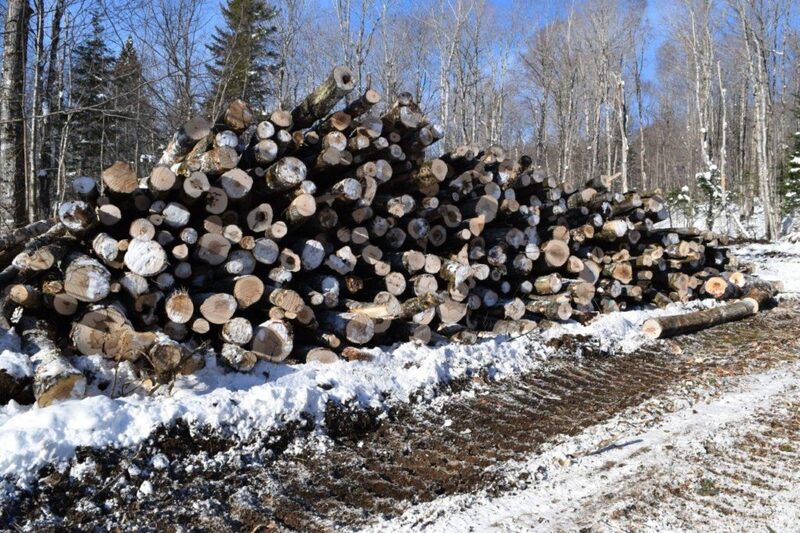 All the sawlogs will go to the LandVest Timber Company (LVTC) sorting yard in Pittsburg, NH where they are graded and scaled. The sawlogs are then sold to a variety of sawmills in the US and Canada to be made into lumber. Hardwood sawlogs being cut this winter on the Randolph Community Forest will be made into furniture, hardwood flooring, and hardwood veneer. Some of the white ash sawlogs will end up as far away as China and sawn into lumber. Products ready to be trucked. LVTC is a subsidiary of LandVest and was created to better market the forest products from LandVest client’s timber sales and to maintain chain of custody requirements for properties with 3rd party green certification. The wood from each client ‘s property is kept separate, and is identified with a unique color. Sawlogs from the Randolph Community Forest are graded and scaled with purple spray paint. If there is the potential to increase value, the sawlog is reworked by trimming the length to remove a defect and move the sawlog to the next higher sawlog grade or possibly meet veneer specifications, which is the highest value product. Forest product markets and equipment have changed a lot since the Brown Company days. 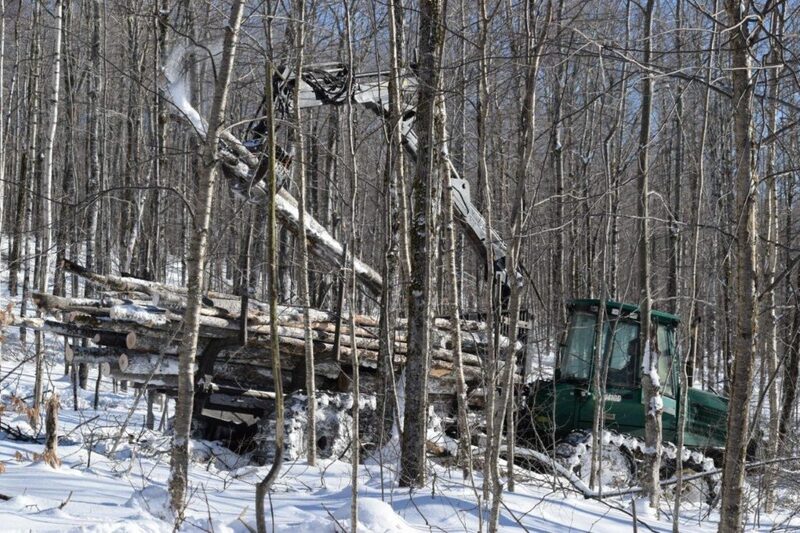 The keys are matching the right equipment to the harvest area to achieve the landowner goals and utilized the timber harvested to its fullest potential.